The electrical conductivity of an aqueous solution is its ability to conduct an electrical current. The electrical conductivity is an important parameter used to estimate the level of dissolved salts in water and soil. Salts include mineral plant nutrients that occur naturally in soil and water, fertilizers applied and also other dissolved minerals that are not plant nutrients and might even be harmful to plants. Distilled water does not conduct electricity. When salts dissolve in water, they dissociate to into ions – positively charged ions, called cations, and negatively charged ions, called anions. This gives the water the ability to conduct electricity. 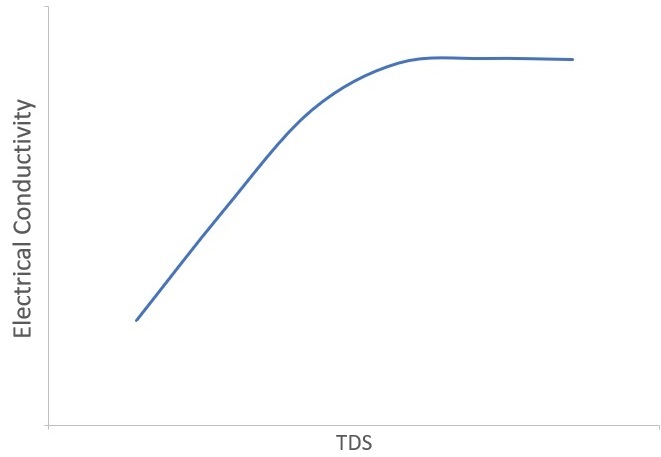 A common parameter used to describe the total amount of the dissolved salts in water is the TDS (Total Dissolved Solids). TDS is the sum of the concentrations of all the dissolved ions, measured in milligrams per liter or ppm (parts per million), where 1 milligram/liter = 1 ppm. The electrical conductivity is, therefore, related to the TDS and is used as a measure of total amount of dissolved salts. Generally speaking, the higher the concentration of dissolved salts the higher the electrical conductivity. However, above a certain concentration of ions in the solution, the electrical conductivity does not increase with the concentration of ions. This is a result of formation of ion pairs, or counterions, that weaken each other’s electrical charge. Plant roots constantly interact with their surroundings, whether it is the soil solution or nutrient solution (in case of hydroponic production). The salt concentration in this aqueous medium – and therefore, the electrical conductivity of that medium – greatly affects plant growth. Osmotic pressure – water uptake by plants is regulated by the transpiration rate and the osmotic pressure in root cells. Water flows through root cell membranes from low-solute concentration to high solute concentration. Therefore, high salt concentration in the soil solution or in the water, reduces water availability to plants. Toxicity of specific ions – although the electrical conductivity level does not provide information on the presence of specific ions in the solution, high electrical conductivity of the soil solution or nutrient solution can usually imply high concentration of particular ions, which are potentially toxic to the plant. For example, high concentration of chlorides, sodium, boron etc. Not all plants respond to salinity in the same way. Some are more susceptible than others. The literature describes the threshold soil EC level for individual crops, above which yield is reduced. The most common unit used to measure electrical conductivity in agriculture is deciSiemens per meter (dS/m). Other units include μS/cm (microSiemens/cm), mS/cm, mmho/cm (milliMhos/cm) and µmho/cm (Moh/cm; a resistance unit). This equation gives an estimate only and actual TDS may vary significantly from the calculated value, depending on the composition of the water solution. 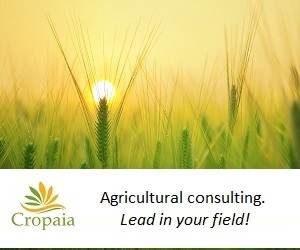 Most EC agricultural standards are given for readings at 25ºC. However, the EC reading may vary depending on the temperature. The higher the temperature the higher the electrical conductivity. As a rule of thumb, the electrical conductivity of water increases by 2-3% for each increase of 1ºC in temperature. It is important not to confuse between different types of electrical conductivity. Readings change greatly when measured in a different medium or different soil moisture levels. ECw – electrical conductivity of the irrigation water. ECe – electrical conductivity of the saturated paste extract of the soil. The saturated paste extract is an extract taken at a specific moisture status of the soil. All EC thresholds related to crop tolerance to salinity are given as ECe. ECe ≈ ECw x 1.3 to 1.5 depending on soil texture, irrigation frequency etc. EC of 1:2 or 1:5 soil extract – the electrical conductivity measured in an extract of 1:2 or 1:5 soil:water ratio. To estimate ECe, or to compare values obtained by these methods, regression equations have to be used. ECb or ECa – the bulk electrical conductivity (also named apparent Electrical conductivity) of the soil, which is the electrical conductivity of bulk soil, i.e the soil water and air. This is a different parameter than ECe. Strong saline conditions. Only high salt-tolerant crops will grow well. Yields of most crops will reduce. Only a few high salt-tolerant crops will grow.